This lesson will teach you how to locate a Regular Assessment. A Regular Assessment occurs when a Student submits work to their Assessor, and the work is assessed directly within Chalk & Wire. 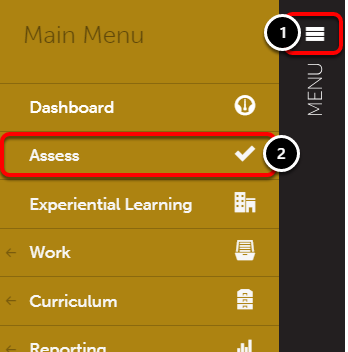 The Assessment Instrument and student work are presented together on the same screen, where the assessor chooses a level for each criterion, and can leave various types of comments. 1. 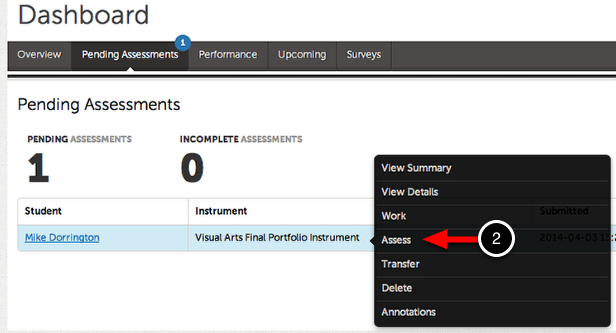 Click on the Pending Assessments tab on your Dashboard. 2. Click on the pending assessment and select Assess from the resulting menu. 3. 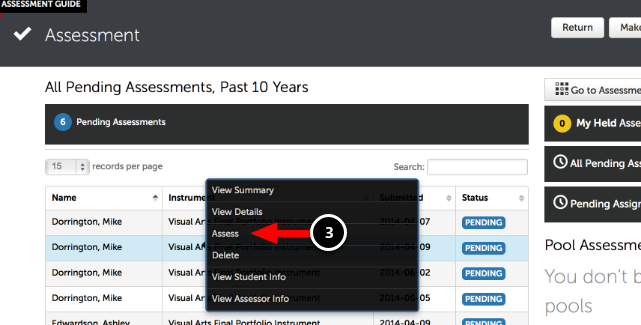 Locate the appropriate pending assessment, and click anywhere on the row to reveal its options. Select Assess. What Do the Different Assessment Statuses Mean? Pending: A "Pending" assessment is an assessment which has not yet been assessed. In order to begin assessing, click on the assessment and select "Assess". Incomplete: An "Incomplete" assessment indicates that you began assessing student work and saved you progress, but did not provide a score for each criterion. In order to continue assessing, click on the assessment and select "Complete". Draft: A "Draft" assessment indicates that you began assessing student work, selected a perfromance level for each criterion, and then used the "Save as Draft" option. In order to continue assessing, click on the assessment and select "Complete". S: A green "S" in the "Assessment Instrument" column indicates that this assessment was generated by a Supplemental Instrument. A Supplemental Instrument allows for one submission to produce two assessments.